Albondigas - meatballs - these were so delicious that I made the waiter ask the cook how they're made (1/2 beef, 1/2 pork...expect to see the recipe on the blog sometime soon). Cafe cortado - Not a pinxto, but a perfect accompaniment - delicious espresso with a touch of milk ("cut" with milk). Amazing how you have to struggle to find a decent cup of coffee anywhere in America, even NYC, but can walk into any random bar in Spain and get a perfect espresso. 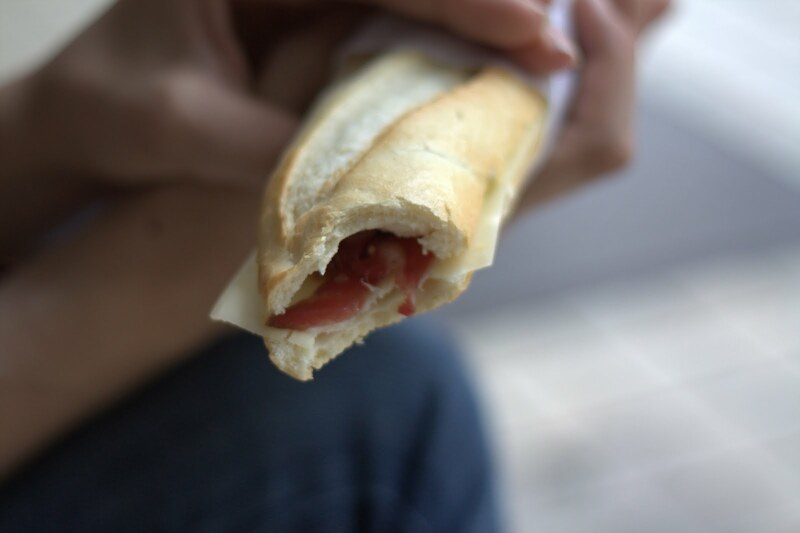 Bocadillo de jamon Iberico y queso - Ham and cheese sandwich - Also not a pinxto, but it can be made into one. We had these for lunch almost every day. Jamon Iberico is a delicacy; it's made from pigs raised in Spain eating only acorns, and until very recently, was not available in the US. It has a silky texture and a perfect level of saltiness - it's the more delicious and sophisticated cousin of prosciutto. The cheese is idiazabal, a Basque sheep's-milk cheese, the production of which is subject to strict regulations (that is, if you want name it "idiazabal"). The bread was always perfectly crispy on the outside and soft in the middle (maybe it was the proximity to France, but all of the baked goods were delicious). If i could eat this sandwich every day of my life, I would, and it still wouldn't be enough. *many of the Spanish words in this post should have accents, but due to limitations of Blogger, do not. If you're looking for a pintxo fix in NYC, GO TO DESPANA. I loved shopping there for chorizo and the like already, but we had some snacks there today (a pintxo for me, a tortilla with jamon serrano for the husband) and they were fantastic. I actually like Despana a little better than Eataly, because I feel it's better-curated with so many samples--but maybe that's the difference between Spanish and Italian food, as the former does have a much stronger culture of preserving and canning foods compared to the latter. Regardless, go there. You will LOVE it.